A tube is inserted through your nose or mouth, down the food pipe (esophagus), and into the stomach. Your throat may be numbed with medicine to reduce irritation and gagging caused by the tube. 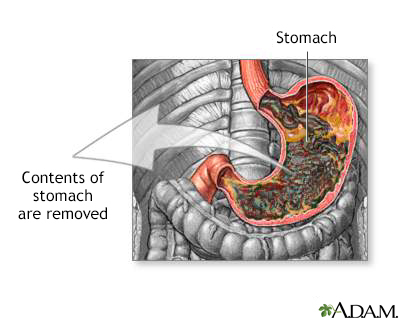 Stomach contents can be removed using suction right away or after spraying water through the tube. In an emergency, such as when a person has swallowed poison or is vomiting blood, no preparation is needed for gastric suction. If gastric suction is being done for testing, your health care provider may ask you not to eat overnight or to stop taking certain medicines. Holstege CP, Borek HA. Decontamination of the poisoned patient. In: Roberts JR, Custalow CB, Thomsen TW, eds. Roberts and Hedges' Clinical Procedures in Emergency Medicine and Acute Care. 7th ed. Philadelphia, PA: Elsevier; 2019:chap 42. Gastric suction is perform to empty the contents of the stomach before it passes through the rest of the digestive tract.